Once again, Stadler will be presenting revolutionary rail vehicles at InnoTrans in Berlin. Stand 103 in hall 2.2 and our stands on the outside exhibition area will focus on presenting modern and individual vehicle concepts. Their technical innovations, high performance and environmentally friendly aspects really set these vehicles apart. Stadler Service will be presenting its spectrum of services at stand 238 on the outdoor exhibition area: maintenance, provision of spare parts, repairs and modernization of rail vehicles. Stadler will also be offering information about education, studying and internships at the career point in hall 7.1 c.
EC250, the world’s first standard low-floor high speed multiple-unit train, will be cruising through the newly opened Gotthard base tunnel from 2019 and this is a highlight amongst the new products on display. Further innovations that will be presented on the outdoor exhibition area from the 20th to the 23rd of September include FLIRT for The Netherlands, the diesel-electric EuroDual locomotive for the UK, the VarioBahn for Aarhus/Denmark, the CityLink tram-train for Chemnitz/Germany and a sleeping coach for Azerbaijan. For the first time, a model of the new S-Bahn Berlin in a scale of 1:25 will be presented at the Stadler stand. Stadler will be presenting the following six vehicles on the outside area at the InnoTrans: EC250, a low-floor high speed multiple unit train for SBB, Switzerland First up, our brand new product – Stadler’s very first high speed multiple unit train – is the main highlight at this year’s InnoTrans. This high speed train is being built for the Swiss Federal Railway (SBB) and is a symbol of the company’s innovative capacity. In October 2014, the SSB ordered 29 eleven-part high speed trains from Stadler, of the model EC250. Less than two years later, the first carriages (Railcolor: 5) are already being presented at InnoTrans. The electric multi-system train units reach speeds of up to 250 km/h and will be certified in accordance with TSI-Highspeed regulations. Step-free, low-floor access, air conditioned passenger compartments, multi-functional and bike compartments and modern WC systems – user friendly for families, seniors and people with limited mobility – ensure a comfortable travel experience. Each of the trains have 403 seats, of which 117 are first class and 286 second class, with 17 seats in the dining compartment. The extensive comfort features and the transparent and open design contribute to the high-quality travel experience. Beginning in 2019, the trains will travel in record time from Zurich to Milan and later from Frankfurt to Milan. The trains are suitable for use on both conventional and high speed tracks. Tried and tested technologies will be combined with the operational requirements of the new trans-Alpine base tunnel. 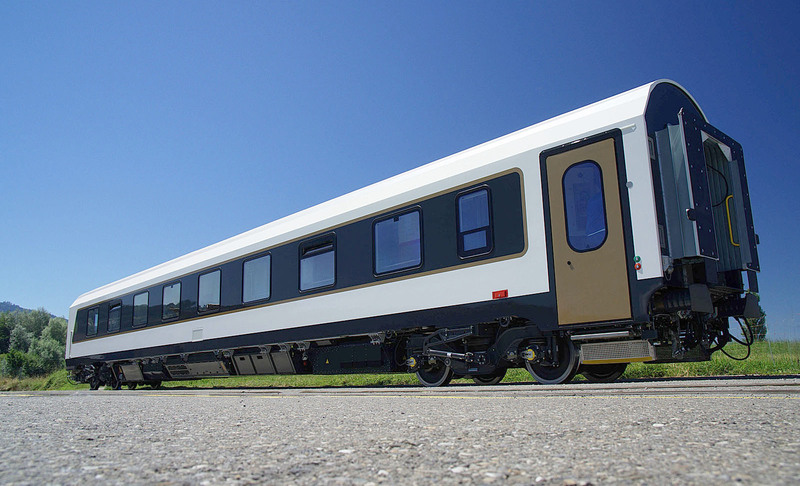 Also, the trains – baptised “Giruno” by the SBB – will be authorized for use in Germany, Austria and Italy. 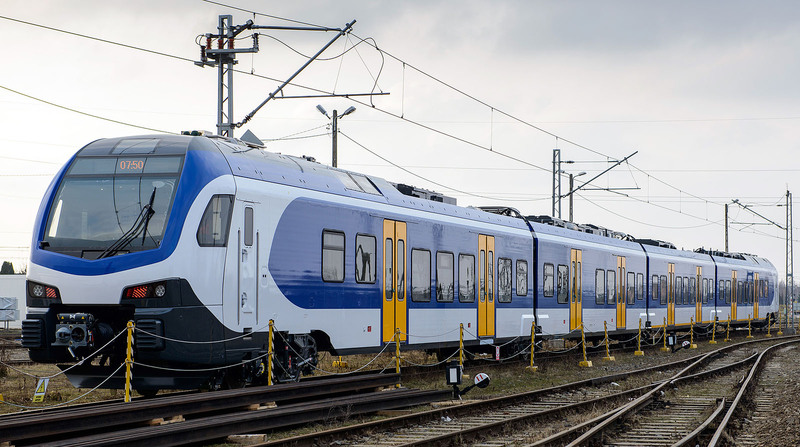 In April 2015, the Dutch railway company NS ordered 58 three and four part low-floor multiple unit trains of the model FLIRT: The trains will be operated by NS Reizigers, used on regional tracks and are intended to travel at speeds of up to 160 km/h. The new FLIRT generation fulfils technical specifications for interoperability TSI PRM, as well as the standards for crash regulations pursuant to DIN EN 15227. The trains’ air suspension systems offer an outstanding level of comfort: Able to accommodate between 158 and 214 passengers (depending on the length of the train), the trains offer comfortable seating in an air conditioned, colorful interior. Space is also available for bikes, pushchairs and wheelchairs. Intended for use on secondary freight routes, locomotives also need to be able to travel without electricity, if necessary. This dual mode locomotive was developed with this in mind. It can be operated using either electricity or diesel. The hybrid locomotives offer the required operational flexibility and reduce transport costs because the same locomotive can be used on all tracks. The EURODUAL is a versatile locomotive with an impressive electrical performance. With up to 7000 kW, even very heavy trains can be transported on busy sections of track at a reasonable speed. The powerful 6-axel locomotive has a driving power of 500 kN. Stadler will supply the new light rail system in Aarhus with 12 Tango light rail vehicles and 14 low-floor VarioBahn trams. The bidirectional vehicles can be accessed at platform level thanks to a floor height of just 385 mm (100% low-floor). The VarioBahn is a modern tram with a modular construction and a high level of flexibility in terms of its length, width, gauge and the catenary supply voltage. The trams for Aarhus are equipped with air conditioning and a modern passenger information system. They also have modern LED lighting that adjusts automatically to suit the amount of daylight, as well as Wi-Fi for passengers and sockets in the seating areas. Verkehrsverbund Mittelsachsen is planning to use 8 hybrid tram-trains. 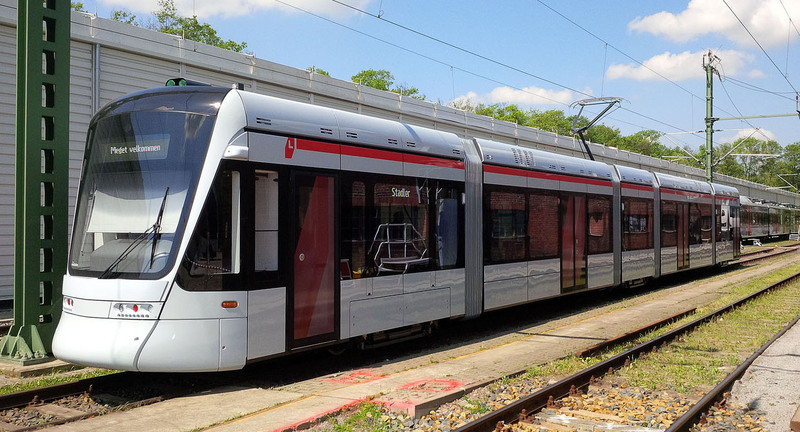 The vehicles are intended for use on the light rail system and on the mainline rail network. The tram-trains can reach maximum speeds of up to 100 km/h. For this reason, the bi-directional tram-trains have been designed pursuant to BOStrab and EBO and are even capable of operating under an additional voltage of 600V/750V DC or using diesel on the tram network. The vehicles are also suitable for use on platforms with different heights and are equipped with toilets and luggage racks. The modular, barrier-free and low-floor light rail system offers passengers a high level of security and comfort – not least due to the passenger information system and the quiet operation. Stadler is building sleeping coaches for the state rail network in Azerbaijan (ADY). They are intended for international use on the route from Baku (Azerbaijan) via Tiflis (Georgia) to Kars (Turkey) and then on to Istanbul. The carriages have been fitted with a pivot mounting with an adjustable gauge wheel set to ensure that they can be used on both the typical Russian broad gauge tracks used in Azerbaijan and Georgia as well as in normal gauge used in Turkey (and the rest of Central Europe). The operational speed is 160 km/h. Every carriage is equipped with an emergency power generator that allows the carriages to operate for 24 hours without using an auxiliary power supply line charged by the locomotive. The coaches are equipped with vacuum toilets and showers (in each first class compartment). The compartment for disabled passengers is fitted with wheelchair lifts and a cabin for the train manager. The carriages fulfil GOST and UIC specifications. Curious for what Siemens will bring? Click here. And Bombardier? Click here.